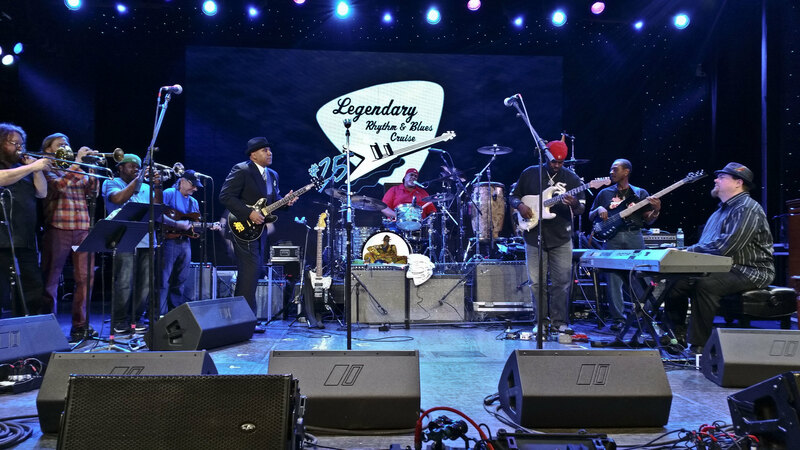 The Legendary Rhythm and Blues Cruise recently took to the high seas in a week long non-stop blues party. The ship was full of incredible performers, from seasoned vets like Buddy Guy and Tab Benoit to up and comers like Quinn Sullivan and Jarekus Singleton. Legends was well represented, and the Buddy Brew was everywhere as blues fans from all over kicked back to enjoy the beautiful weather, the wild costumes, and the great music. From Legends, Buddy had right-hand man Johnny Sims acting as ambassador, giving out t-shirts, auctioning off a signed guitar for charity, and knocking back Buddy Brews with everyone on board. We want to thank everyone involved for making it a special experience, especially Roger, who brought it all together. Of course the staff and crew did a great job keeping everyone fed and tipsy. If you’ve never taken a cruise or heard screaming electric guitar ringing out over the ocean, then get yourself to bluescruise.com and sign up now.